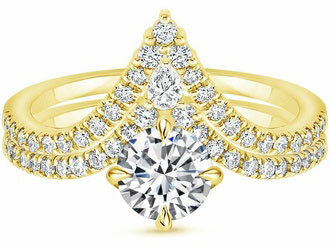 Antique style engagement rings have long been some of the most popular types of engagement ring designs. In fact, many of the engagement ring and wedding ring styles from bygone eras were such an instant hit that reproductions of these rings have been created for well over a century. 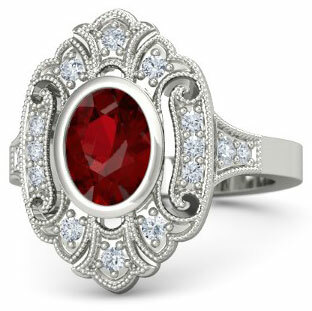 Below you will find antique style wedding rings from the Victorian, Edwardian, Art Deco and Retro eras which display the captivating designs and features that antique rings are so well known for. 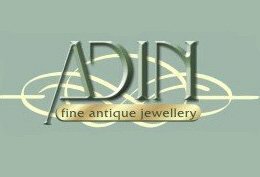 But, if you are curious about Authentic Antique Engagement Rings take a look at this page to find real antique and vintage rings from the early 1800s up through the post-World War II years. 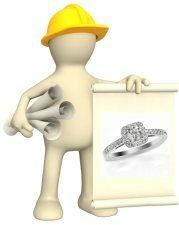 You can also find out more about the engagement ring styles and designs from the ages on EWR’s History of Wedding Rings page. 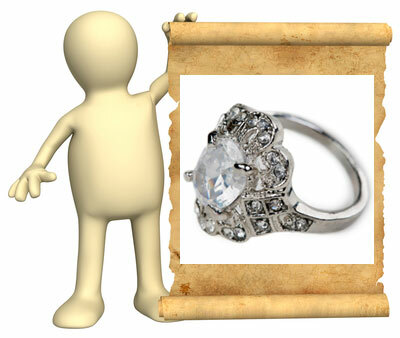 The Victorian era is when the engagement ring really made its debut into society. In this era, jewelry was no longer restricted to royalty and the nobility. 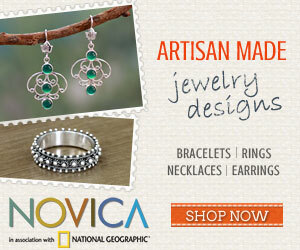 And Queen Victoria’s love of colorful natural themed jewelry pieces led to an entire revolution in jewelry design. 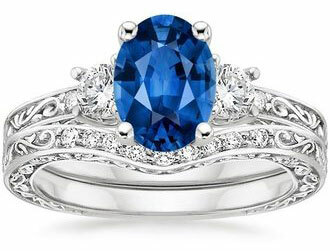 Victorian style engagement rings reflect many of the unique designs of this era including the use of colorful gemstones, intricate carved and engraved bands and curvaceous designs inspired by nature. Antique style engagement ring settings which reflect the Victorian age include simple claw prongs, flower and cluster arrangements and crimped metal edging effects. By far, the most popular style throughout this age was the Victorian cluster ring crafted with diamonds, gemstones and pearls. Victorian style cluster rings showcasing round brilliant and oval diamonds or captivating gemstones are a fine choice for eye-catching engagement rings. 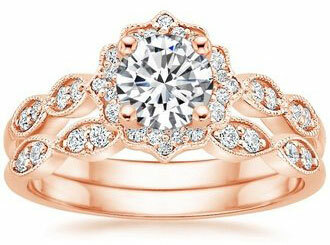 Rose gold engagement rings were very popular during the Victorian years, as were solitaire diamonds rings. Antique style wedding ring bands featuring intricate carved and engraved designs, colorful gemstones and plenty of diamonds emulate the type of bands known to the Victorian age. Sparkly diamond row ring styles from this era, and the splint shank diamond rings introduced in the Victorian days, are a favorite with couples searching for antique style diamond engagement rings too. Later in the Victorian age, diamonds became widely available and larger diamonds for the first time were more accessible for creating jewelry pieces. 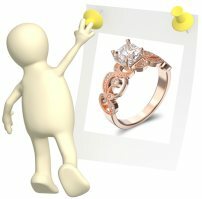 As a result, wedding and engagement rings created in the late Victorian years are known for their use of diamonds, and Victorian inspired engagement rings reflect these styles. Edwardian engagement rings were made with amazing, innovative filigree metal works seen for the very first time during these years and Edwardian rings were often crafted with the two most popular jewelry materials for this time period: platinum and diamonds. Milgrain antique style engagement rings reflect the delicate designs that were so highly treasured during the turn of the century and which are a hallmark of Edwardian jewelry styles. The burgeoning Art Nouveau designs emerged during this time too which were a stunning combination of curves and natural impressions. Liquid-like metal effects merged with organic shapes and mirrored the movement which resisted the staid mass produced jewelry pieces of the new Industrial Era. 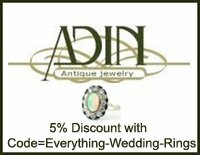 Antique style wedding rings which resemble the one-of-a-kind artistic Art Nouveau rings are a great place to start if you are searching for unique engagement rings. 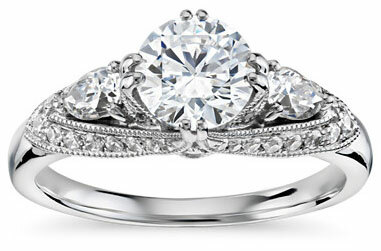 Top Vintage Inspired Wedding Ring Picks! 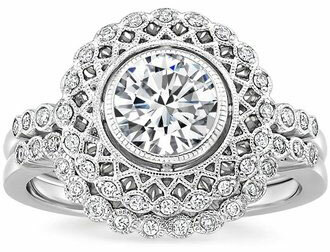 Some of the leading vintage style engagement ring styles are drawn from the amazing Art Deco design movement. Geometric shapes and patterns, the use of sapphires, emeralds and rubies and plenty of diamonds were strong themes during the Art Deco days. 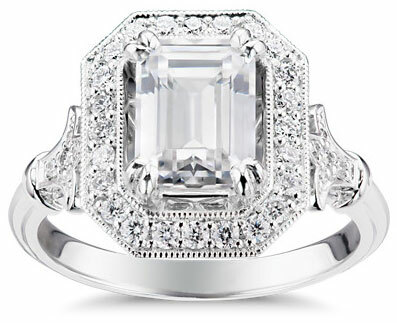 In recent years, Art Deco style engagement rings have become top favorites for vintage style diamond engagement ring designs. 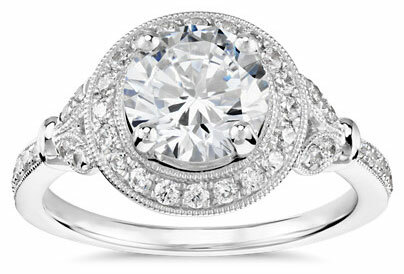 Last, but definitely not least, are the bold vintage style engagement rings from the Retro years. The post-World War II boom filled with patriotism and a skyrocketing economy clearly had an effect on ring styles. Large diamonds, sapphires and rubies, and grand glittering cocktail designs ruled the day. Impressive sunburst rings were a leading favorite, cluster rings came back into style, and the use of baguette diamonds were very prominent during the Retro years. 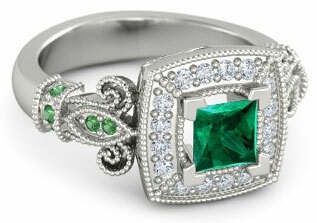 Retro ring designs also borrowed heavily from Victorian, Edwardian and Art Deco themes. Milgrain metal works, tapered bands, simple antique style engagement ring settings, natural shapes and curves and geometric flairs can all be seen in Retro vintage style wedding rings which are drawn from authentic Retro ring styles. 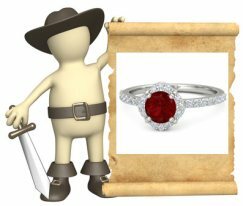 Two of EWR’s favorite resources for antique style engagement rings (which are shown in the pics and links above) are Brilliant Earth and Gemvara. 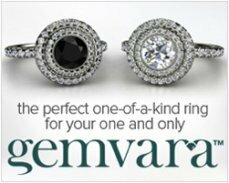 Gemvara is the ideal place to start your search for gorgeous antique and vintage style engagement ring designs made with diamonds and colorful gemstones including rubies, sapphires, tanzanite stones and bright watermelon tourmaline gems. 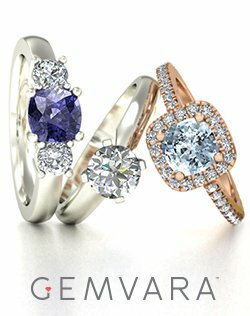 Plus, ring designs at Gemvara may be customized with gemstone type and diamond size of your choice. 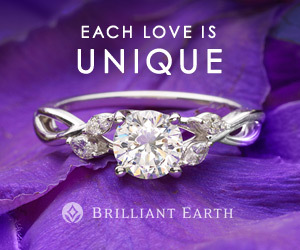 Brilliant Earth has quite an impressive selection of vintage inspired engagement rings, wedding sets and antique style diamond rings. BE is also a terrific source for authentic genuine antique and vintage rings - if you see a genuine antique ring that you absolutely love, whether from BE's collection or elsewhere, Brilliant Earth’s design team can Custom Create an exact replica for you! 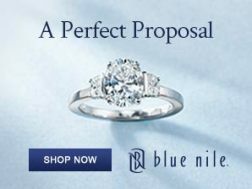 Blue Nile has a beautiful collection of vintage style engagement rings in clean, simple designs to twisted wrapped bands and large halo diamond creations. If you are looking for an engagement ring with a classic look combined with a vintage flair, BN might just have what you are looking for. Antique style diamond engagement rings should come with diamonds that have been certified by one of the four top diamond laboratories in the world. The GIA (ideally), the AGS, the EGL or the IGI. 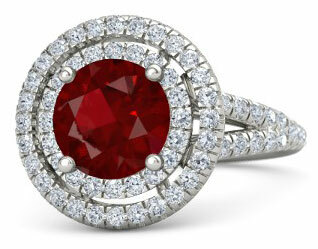 Use particular caution when shopping for gemstone engagement rings. 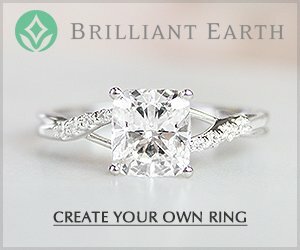 Stick with reputable retailers to ensure that your ring is crafted with ethical, genuine gemstones that are in excellent condition and fairly priced. 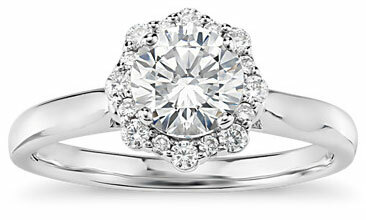 Platinum is by far the best metal for premium engagement rings, followed by palladium and 18k gold. 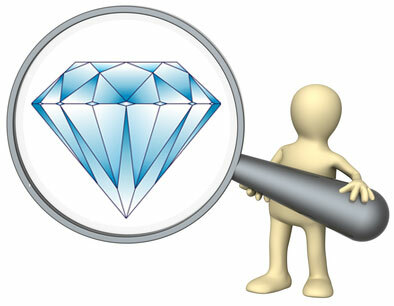 Remember that white gold will require Rhodium Plate. 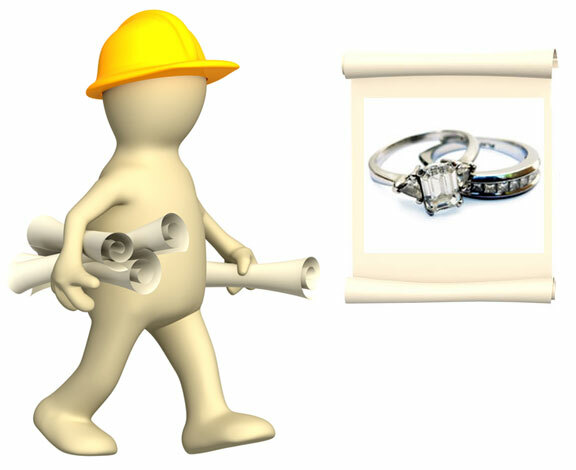 If you would like to forgo the expense and bother of re-plating the ring every few years, choose antique style engagement rings made with platinum, palladium or silver rings – or rings made with yellow or rose gold. Cushion and emerald diamond cuts are a favorite for vintage style wedding rings, but these types of cuts do sacrifice a little bit of brilliance and fire. If you want an engagement ring with plenty of sparkle and flash, choose a ring made with brilliant, princess, Asscher, or radiant cut diamonds. For two-tone antique style engagement rings, make sure the rings are made with either inlay or entwined solid metal bands. Any type of two-tone plate should be avoided completely as the plate will quickly chip and wear away in a short amount of time.